Valentine's Day is Wednesday and there are plenty of ways for you to cash in and get some great deals all in the name of love. Many local restaurants and chains are offering some sweet treats for you and the one you love. Hooters: Shred 'Em and Forget 'Em! Bring in a photo of your ex and they'll destroy it for you. Plus, it will get you 10 free boneless wings with the purchase of any 10 wings. If you don't want to do it in the store, you can do it online and get a coupon for the free boneless wings. More info here . Jersey Mike's Subs: Join their email club and you'll receive a coupon for FREE chips and a drink with any regular or giant sub purchase. You can cash in on this deal from February 13 to February 16, 2018. Auntie Anne's: The pretzel maker is offering heart-shaped original or cinnamon sugar pretzels on Wednesday. If you're part of My Pretzel Perks you can receive a buy one, get one free offer. To get the offer, you need to download the free app before noon on Tuesday, February 13. Dunkin' Donuts: You can get special heart-shaped and Valentine's Day themed donuts from the coffee and donut giant. Chick-fil-A: Chicken is the new chocolate, according to Chick-fil-A. Participating Chick-fil-A restaurants are offering a 30-count nuggets or 10-count Chick-n-Minis in a heart-shaped container. Get more information here . 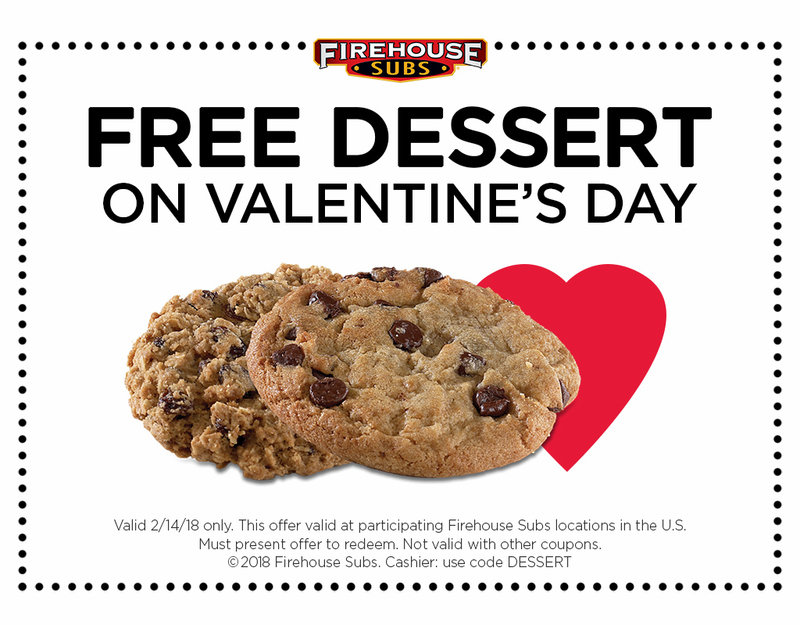 Firehouse Subs: Firehouse Subs is offering a free dessert on Valentine's Day. You can pick between a brownie or a cookie. Click here to get the coupon . Baskin Robbins: Get a heart-themed ice cream cake or Polar Pizza ice cream treat on Wednesday, February 14th. Get the coupon here . Papa John's: You're the pizza pie of my eye. Get a heart-shaped one-topping pizza and dessert for $15 or two heart-shaped one-topping pizzas for $18 at your local Papa John's. Qdoba: I love you like I love queso! If you buy one entree you can get another free on February 14th. McAlister's Deli: It's a family date night! Kids eat free on Valentine's Day at McAlister's. Just purchase one adult entree and you will get up to 2 kids meals for free. Get more info here . Waffle House: Fine Dining at Waffle House? Yup! The casual-dining restaurant is pulling out the white tablecloths for Valentine's Day dinner at more than 170 locations in 19 states. Find a location near you and make a reservation here .